We are a brand new dental clinic established by three young, highly skilled dentists. We are located on the Main Level of Metrotown Centre (below the Food Court and across from the Disney Store). In addition to our dentists we have on-site cosmetic services including a broad range of whitening options, veneers, implants and Botox as well as an on-staff Endodontist and Orthodontist to provide convenient scheduling and lower cost specialist services. 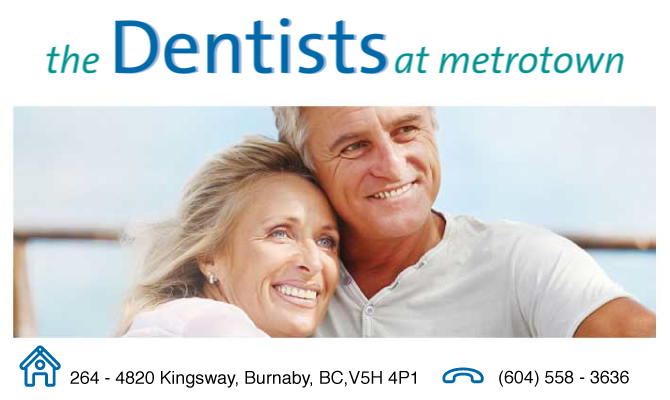 Our focus is making your visit to a dental clinic as friendly and comfortable as possible. If you have ever had trouble getting or changing an appointment to fit your schedule, maybe you should consider us. Open 74 hours a week, 7-days including Sunday and we stay open until 9:00 pm every weekday and 7:00 pm Saturday and Sunday. We also offer emergency services every day of the year including Statutory Holidays. We are in the process of introducing a mobile app which will allow you to book an appointment and receive immediate confirmation on your smart phone and we confirm by text or email message if you prefer. Our dentists have a keen interest in how technology can be used to increase patient comfort. Our clinic is equipped with the leading-edge dental technology to increase diagnostic and treatment precision including the latest in pain management technology. The combination of all new technology and a ZEISS surgical microscope virtually eliminates the risk of post-treatment pain and the need to repeat a treatment. Our objective is to provide the greatest treatment experience for you – an experience so good you won’t even remember it the following day. Restoring or improving your smile is one of the most important decisions you can make. The old saying that “friendships begin with a smile” is truer today that it ever has been in the past. For simpler, cost effective adjustments to improve your smile our dentists are InvisalignTM specialists and we offer interest-free financing plans to fit every budget. Our in-house Orthodontist is a DAMONTM and InvisalignTM expert and she is available at any time with free consultations and interest-free financing plans for children and adults. We speak 17 different languages in our clinic which makes it much easier for patients to establish the personal and professional relationship with our dentists and specialists that is so important to good healthcare. And, it helps a lot in creating a welcoming environment for your family members too.